Heraldry has to do with family Mottos and Coats of Arms, and the Pearces have plenty. The word comes from the German “heer,” a host or army, and “held,” a champion [WWW.GENEALOGYWEB.COM]. As jousting tournaments became popular, first in mid-11th century France, bearing a Coat of Arms became a prerequisite for participation. By the 15th century the colorful Shields and Banners became a symbol of noble status. Coats of Arms and Mottos have been studied for at least 700 years and are generally found together in such resources as Burke’s General Armory. More than half a million Coats of Arms have been recorded by families worldwide. But, of the million or so surnames in use today, less than 75,000 can be associated with a particular Coat of Arms. Does the fact that we have discovered over a half a dozen for the Pearces have to do with the many spellings of the our name or with the various branches and their locations of origin? These are some of the questions we will attempt to answer in this article. If you should come upon additional Crests (a part of a Coat of Arms often used to refer to the whole) or slogans, please write to me [PEARCE@ATLANTICBB.NET]. *HELM or SKULL – dome-shaped helmet designed to deflect blows. *CREST – could be a plume or feather atop the headpiece or a fan-shaped construction of painted parchment on a wood or metal frame. VISOR or SIGHT – permitted limited vision but was small enough to reject weapon thrusts. The vertical openings were called BREATHS. The visor could be lifted or removed when not in use. GORGET – the neck cover was a series of curved plates tied or chained together. PAULDRON and VAMBRACE – upper and lower arm defenses curved at the elbow with cupped plates called COUTERS. The RONDEL or BESAGEW, a circular plate, was tied or riveted at the shoulder. All this armor was usually strapped over chain mall. BREASTPLATE – perhaps the largest and most important piece could be a single plate or a series of smaller plates chained or riveted together and tied or buckled across the open back. Some armor also had backplates. LANCE REST – a type of clip or arm that allowed the weapon to sit along the waist. It could be removed when not in battle or tournament. TASSET – a metal skirt that encircled the hips. CUISSES – curved plates around the legs consisting of the GREAVES, which covered the upper and lower legs, and the POLEYN, which protected the knees. SABATON – metal shoe coverings. GAUNTLETS – hand protection proved by metal cuffs, wrist plates, and rows of finger-coverings consisting of overlapping scales. *SHIELD – hand-held and mobile metal protection generally triangular in shape, which allowed visibility at the top and maneuverability on horseback along the bottom. Because the knight was covered from head to toe and didn’t want to be mistaken as the enemy by his own army, he would paint a pattern on the battle shield. In addition, the crest could contain his colors, or symbols, or the family name could be woven into cloth to be worn over the armor or even draped over the horse upon which he rode. This colorful identification was worn with pride and later recorded as “armorials” or “blazons.” The later term is German for “to blow the horn,” a reference to sounding the trumpet to announce the knights about to joust in a tournament. Quartering, or dividing the shield into sections, came later as the practice of referring to other families, acquired through marriage, became popular. HELM – The helmet varies with the bearer’s rank or the century. CREST – Whatever appears above the helmet, not found in every instance. SHIELD – The colors and charges are part of the blazon, and the shapes vary according to the geographical origin as well as the time period. WREATH – Consists of the primary color and metal. MANTLE – Represents the cloth that hung from the wreath and protected the back of the head and neck, often depicted as the leaves of a plant. SUPPORTERS – Two animals, birds, or persons appearing on either side of the shield. DEXTER and SINISTER – right and left sides of the shield respectively, from the knight’s perspective. TINCTURE – colors on the shield, usually two metals (gold/yellow and silver/white), seven colors (red, green, black, blue, purple, maroon, and orange), and various furs (ermine and vair/squirrel). CHARGES – representations of animals, people, monsters, divine beings, or natural or man-made objects. The actual design on the shield can be either Ordinaries (there are 7 of these shapes) or Sub-ordinaries (count 14 of these). Partitions separate the various styles. The first Coat of Arms we will look at, which we will refer to as “Roses and Coughs” (which rhymes with “crows”), ironically, does not have a Pearce family motto recorded with it. Was that because the Pearces didn’t engage in battle or battle cries or was the Motto simply lost over time? We do know that by 1419 King Henry V had to impose strict regulations over the use of Coats of Arms and Mottos because court battles were becoming numerous and bloody. He forbade new registrations unless by right of ancestry or as a gift from the crown. By the time of Henry VIII (1491-1547), official heralds, known as Royal Authenticators of Arms, were sent at least once a generation across England on “visitations” to verify or deny Arms in use. The language of the heralds was French [see Part I on the Pearce name]. 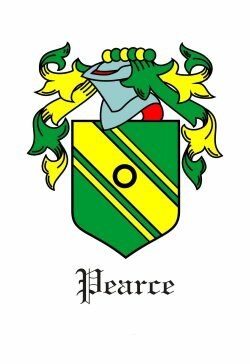 As I said before, there are over half a dozen different Pearce Coats of Arms, not all of which we’ll discuss here, but most of these that we know of have Mottos. Quarterly, 1st & 4th., ar. On a mount vert three hearldic roses gu. Stalked and leaved ppr. : 2nd. And 3rd., ar. Three Cornish coughs sa. Beaked and membered gu. Above the shield and helmet is the Crest which is described as: A Cornish cough, as in the arms (Halbert). We were unable to find any definition or description of “coughs,” but we assume that they are versions of blackbirds, ravens, or what Americans call crows. Halbert says that such symbols, or charges, may represent an artistic interpretation of the family name. Webster associates “Cornish” with the land of the ancient Celts, Old Bretons, and more recent Welsh [see “Original Family Narrative” for reference to Old Bretons and Part I in this series for a Welsh connection]. Could the blackbird be a symbol of geographic origin, or might it have to do with the gruesome reputation of the ravens still found at the Tower of London? We hope not. In less civil times, they would publicly “clean” the impaled heads of executed criminals and martyrs. Today, in America at least, all birds that are black have dark reputations as noisy scavengers. On a more positive note, the roses stands for joy. A second Coat of Arms is really just a variation of the above. Still a third Crest, which we don’t have a picture of, is described as: Vert on a bend costised or, an annulet sable. Given to me by my brother Paul and sister-in-law Cynthia in the forms of a key-ring and postcard, the Shield is described as “Black with a silver chevron between two gold unicorn heads.” The unicorn is a mythical symbol of good fortune and even sexual potency. The Crest is “A red wyvern” [a 2-legged, winged creature resembling a dragon]. Might this be thought of as something to be slane? Is there a connection to the motto, “Nihil Amanti Durum,” which translates “No lover is unfeeling” [The last word may also be translated “hard,” “harsh,” or “cruel,” whichever suits]. Our fifth and final Coat of Arms for discussion here was purchased on a coffee mug with a printout at the Historical Research Center, Warwick Castle, England, during our 1996 trip. I’ve seen references to the leopard as representing the Irish Pearces, but the document only coincidentally refers to Patrick Pearse (1879-1916), the president-elect of the provisional republican government in the early 20th century, who was publicly executed by a firing squad by the British on Easter Sunday. He had signed an illegal declaration of independence. This Coat of Arms is a single yellow leopard on a white shield with three bees flying above. The fur ermine is a symbol of nobility. The leopard represents a brave and courageous warrior, and the bee signifies well-governed industry. The Crest has a smaller leopard holding a smaller white Shield with a single bee on it. The Helmet and Banner are gold. CHEVRON (column shaped like ^) – Represents the roof of a house, signifies protection and faithful service. If we were to put many of these together, we might see a noble yet geographically diverse family who seeks peace through a strong and faithful defense of the home and the homeland – a family life full of constant love, joy, and hope, yet accepting of the disappointments that life brings. Under traditional heraldic rules, only first sons of the original recipient are permitted to bear their ancestor’s Arms. Younger sons may use a variation of their father’s Arms. If the “armiger,” or original bearer, dies without male heirs, his daughter may combine her father’s Arms with her husband’s. This is called “impaling” [not to be confused with anything at the Tower of London]. Halbert says, “Although these principles seem formal today, they do give us an idea of the rich, protective tradition which surrounded heraldry through the ages” (3.3). We wonder, in these days of women’s liberation and cohabitation, what happens if a woman doesn’t marry. What did Joan of Arc carry? Come to think of it, the Cross was enough for her. The office of Earl Marshall, head of the College of Arms in London, has served by royal appointment for centuries. Unfortunately, heraldry began to be abused in the 1700’s, usually as a way to collect revenue from people without legitimate lineage. The Victorian era, with its emphasis on status, saw the culmination of abuse. We have not yet contacted this office to validate any of the above Arms, but we hope to in the future. We believe that it is possible that some of the above are “fake(s),” but with over a half a dozen to consider, surely at least one is valid, and we should be proud of it. 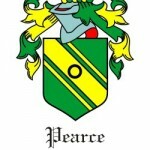 Perhaps there are additional Pearce Coats of Arms to find or variations to be discovered or questions we might ask. Let’s be open to the possibilities. Note: The next article, Part III in this series, will introduce you to some of the most famous Pearces of the past 500 years.